Power your Internal SATA hard drive from an LP4 connector on your Power Supply. 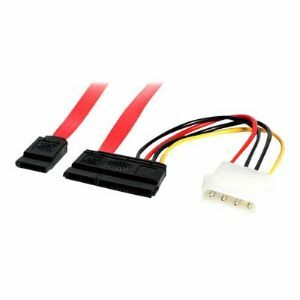 The SATA18POW SATA Data and Power Cable features a combination 22-pin SATA receptacle data and power connector as well as a LP4 power connector and SATA receptacle data connector, allowing you to create a conventional Serial ATA data connection to a computer while powering the drive through an LP4 connection to the computer power supply. 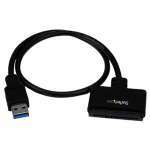 This high quality SATA power/LP4 adapter cable measures 18in, providing the flexibility required to position the SATA hard drive as needed within the computer case, while eliminating the expense of upgrading the computer power supply for the sake of SATA compatibility.